301 v. : ill. ; 26-28 cm. FOS-1 (Mar. 1937) - FOS-301 (Oct. 1980). Issued by: Agricultural Marketing Service, 1954-Mar. 1961; Economic Research Service, May 1961-<Oct. 1977>; Economics, Statistics, and Cooperatives Service, <May 1978>-July 1980; Economics and Statistics Service, Oct. 1980. "Approved by the World Food and Agricultural Outlook and Situation Board," Oct. 1977-Oct. 1980. .:. 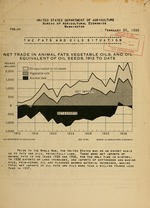 ,500 L 1 l .
ANIMAL FATS IN THE YEARS 1935 AND 1936, FOR THE ONLY TIME IN HISTORY. : Dec. :Average: Jan. : Dec. :Average: Jan.
Cleo oil, No. 1, N.Y.
2/ Converted to U.S. cents per pound at current monthly rates of exchange. reduction in imports of most raw nrterials for oil nnnufncture. on record except in Dccer!ber 1933.
largest ever reporte1 (See table 7). 1937. Crude coconut oil averaged 2.8 cents lower for the oear. Other oils showed similar reductions in price. in demand resulting in increased consumption and higher prices. of flaxseed in 1938 were only about half the imports in 1937.
were the largest since 1933.
on hand were practically the same in December 1938 as in December 1937. 6.71 cents per pound in 1938 compared with 8.01 cents in 1937.
and prices throughout 1938 averaged considerably lower. compounds and vegetable cooking fats. Oil equivalent of imported seed. oils kmen reported. Does not include unnamed miscellaneous items. Est: '..ne, tased on factory consumption, trade, and stocks. l^i .*. mo:-n.(l, fish, and fish-liver oils. Incl.r.ii oteo oil, oleostearine, oleo stock, and edible tallow. Includes wool grease and neatsfoot oil. Oils, except as otherwise noted. Figures in parentheses are rough preliminary estimates. :Mil. lb. Mil. lb. Mil. lb. Mil. lb. Mil. lb. Agriculture Statistical Bulletin, No. 59. Marine mammal, fish, and fish-liver oils. SEdible and inedible not separately reported prior to April 1936. Crude and refined converted to crude basis. Estimated imports of rapeseed oil, based on stocks in bonded warehouses. have been reported, but it is known that some was crushed in 1935 and 1936.
based on the excess of imports over previous averages. / Includes less than 500,000 pounds iorartA oil. purposes other than crushing. See Statistical Bulletin No. 59. Leaders ( ) indicate less than 500,000 pounds or not separately reported. Items have been rounded to "million pounds" without adjustment as to totals. seed 37 perceEF, and mustard seed 23 percent. ports for consumption as available. See Statistical Bulletin No. 59.
:Mil.lb. Mil.lb. Mil.b..Mil.lb. Mil.lb. Mil.lb. Mil. b.Mi . 2/ Crude plus -efined in terns of crude. SIncludes corn, castor, and linseed oils. Exports, including shipments to noncontiguous territory. Grease, inedible tallow, neatsfoot oil, and marine animal oil. Oleo oil, oleostearine, oleo stock, anc. edible tallow. terr.s of oil equivalent, 1931-38. Mil. Mil. Mil. Mil. Mil. Mil. Mil. Mil. lb. b. lb. lb. lb lb. Ihb. Ib. hydrogenated oils, red oil, lard oil, andr tallow oil, etc; excludes butter. reported in imports for consumption. 240 228 2,880 246 232 3,593. S6.95 7775 97.423 7.6 7---.91 ---10--- 5. May be either foreign or domestic oil. /Bureau of the Census; probably oil imported from Japan.